Tours and transfers as specified including entry fees, on a private basis in modern air-conditioned vehicles. Other meals than those specified. Your adventure begins at the conclusion of your welcoming ceremony. After boarding your motor coach you’ll drive through the emerald green hills and into central Bali. Your first stop is Sangeh Monkey Forest, a 34acre sanctuary for hundreds of monkeys. Visit the 400 year old Pura Bukit Sari Sangeh Temple. Next on your itinerary you’ll see Lake Bratan. Located almost 4,000 feet above sea level, this sparkling lake sits in the crater of Mt. Catur. Then, you’ll make a photo stop at a viewing area where you can look out over the “twin lakes,” Buyan Lake, the smallest lake in Bali, and Tamblingan Lake. Continuing on, you’ll head over to the highland village of Munduk for lunch. After lunch you’ll visit the colorful Pasar Candi Kuning market. In addition to fresh fruits and vegetables, you can also purchase handicrafts, paintings, and fabrics. Your final destination is the village of Tohpati, famous for its fine batik. After observing the batik process you can try your hand at painting traditional batik designs. Later, you're invited to browse for souvenirs, gifts and fine Balinese crafts. When your exciting highland exploration comes to an end, you’ll return to your motor coach, perhaps laden with crafts from the market or Tohpati, for the relaxing ride back to your ship. All services which are not mentioned on the program above. You will be met at your cruise vessel by your private guide and vehicle for a Perth City Sights tour. You start by visiting Kings Park, which occupies approximately 400 hectares of Mount Eliza overlooking the city of Perth and the Swan River. The Park has much to offer with its sweeping parklands, Botanic Garden, wildflowers (which are spectacular, especially in spring), and native bushland (two-thirds of the park). Enjoy the expansive city and river views. The magnificently sited State War Memorial is also one of several scenic vantage points. Enjoy a morning tea stop before leaving the city to one of Perth's best kept secrets, Cottesloe Beach. Its crystal clear waters, regular swell and fun atmosphere make it popular with swimmers, body boarders and surfers alike. Cottesloe's famous pine trees provide welcome shade from the sun and grassy areas to relax in. On conclusion of the tour, you will be transferred back to the port to reboard your cruise vessel. 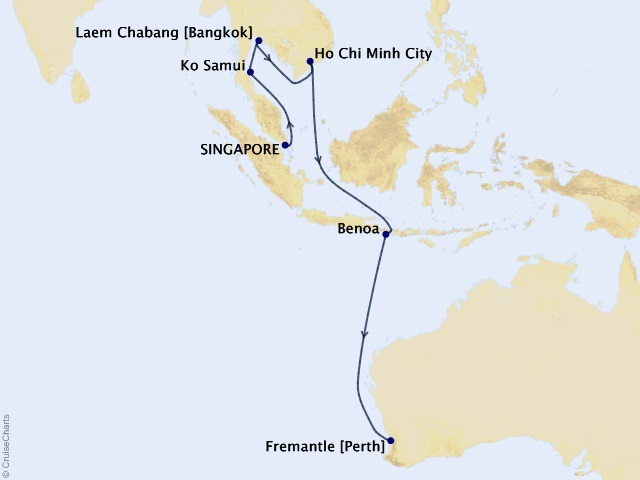 You will be met at your cruise vessel by your private guide and vehicle for a day tour of Perth and Fremantle. You start by visiting Kings Park, which occupies approximately 400 hectares of Mount Eliza overlooking the city of Perth and the Swan River. The Park has much to offer with its sweeping parklands, Botanic Garden, wildflowers (which are spectacular, especially in spring), and native bushland (two-thirds of the park). There are extensive city and river views with a panorama to the Darling Scarp. The magnificently sited State War Memorial is also one of several scenic vantage points. Enjoy a morning tea stop before making your way out of the city to one of Perth's best-kept secrets, Cottesloe Beach. Its crystal clear waters, regular swell and fun atmosphere make it popular with swimmers, bodyboarders and surfers alike. Cottesloe's famous pine trees provide welcome shade from the sun and grassy areas to relax in. Then travel back to Fremantle which oozes heritage and cosmopolitan culture. Every day of the week, the streets are abuzz with shoppers and al fresco diners, while pubs brim over with patrons from across the globe. Best known for its docks, marinas, and charming heritage sandstone buildings you head to Victoria Quay to visit the Western Australian Maritime Museum. It is designed to depict a boat stranded on a sandy promontory and houses famous sailing vessels along with hands-on exhibits bringing sea-faring heritage to life. Lunch today is included at a local restaurant. On conclusion of your tour, you will be transferred back to the cruise terminal. If you believe that the journey is the adventure, then the fabulously carefree days at sea are sure to inspire the most meaningful stories. Mornings of yoga and Pilates, a rejuvenating hot stone massage, or a jog around the Promenade Deck. Afternoons quenching your curiosities about digital filmmaking at the Creative Learning Institute, sampling rare wines at a tasting, traditional afternoon tea every afternoon in the Pam Court, or mastering our technology skills on 27" iMacs® - conveniently dual platform for Mac and PC users - at the Computer University@Sea. Perhaps you'll attend an intriguing lecture or a lively dance class, practice your hand at painting, or perfect your golf game using TaylorMade® clubs at a PGA pro-hosted clinic. With Crystal, the choices are as endless as the sea. Please note: It is not possible to connect a laptop through the shipboard phone system directly to any phone number ashore for dial-up services. Skype, iChat, Facetime, and other similar services are not available on board. The popular Computer University@Sea program is offered on all cruises. CU@Sea provides e-mail services, internet access, group and individual instruction on use of a PC, extensive enrichment course offerings, and digital camera support. Complimentary classes allow you to master new technologies with Mac OS or Windows on 27" Apple computers, and each ship has at least 25 state-of-the-art workstations. Details on CU@Sea programs, classes and hours are listed in the onboard daily newsletter Reflections. Internet Fees apply for internet access. Rental PC laptops are available for guests' use on board for a nominal daily charge. From these specially configured computers you can access the Internet, as well as your shipboard e-mail from your stateroom. The current schedule of charges is available on board. A wide choice of pre-packaged kosher-certified meals, including meats, seafood and poultry, as well as white and red kosher wines, is available on a limited basis, on every itinerary. All chefs, kitchen and dining staff have been trained in kosher food preparation, handling and servicing. Only kosher pots, pans and utensils are used, and plates, silverware and glassware are washed separately. Due to limited provisioning resources, the number of guests per cruise who may partake in a kosher-style program is restricted to 20. Guests whose diet requires, or who wish to dine kosher-style, must provide Crystal Cruises with advance notice at the time of the initial reservation, and no less than 90 days prior to sailing. Crystal will do all they can to ensure guests' needs are met. Due to limited availability, kosher-style dining is subject to confirmation from Crystal Cruises.